“It was the best day of my life,” Sarah says about the day she and Gary adopted two kittens. They had gone to a KiddyKind adoption event to adopt one, but because kittens are so in need of companionship, the rescue group rarely places single kittens. Two adapt to their new home more readily and avoid loneliness, and while one kitten requires almost constant entertainment to ward off boredom, two kittens entertain each other. Sarah and Gary were convinced. Animal enjoys time with Gary and Sarah. Buying a pet had never been on the table. 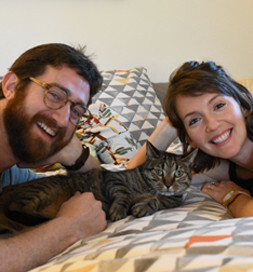 “There are so many cats up for adoption,” Sarah says, “purchasing one never crossed our minds.” Sarah had originally suggested getting a dog, but Gary had never had a dog or a cat, only small pets-a frog, gerbils and a bird-and he felt more comfortable getting a cat-in this case, two kittens. Once home, the couple was delighted that the kittens trained themselves to use the litter box. But there was a period of adjustment because both kittens were skittish, and Violet was so scared she wouldn’t eat. Coming home, though, is extra fun when you know two cats will be waiting to greet you.